In the late 1700s the roots of cowboy culture arose out of the Carolinas. These men and women were not the typical white ranchers that would be depicted in later stories and films. Instead they were a group of “tri-racial isolates.” While much is now being published about Melungeons, little has been written about the cowboy Redbones. The Redbones followed Reverend Joseph Willis to Louisiana in the early 1800s. He was the patriarch of the group and con-tributed his Baptist ministry to the spiritual composite that would make up their religious heritage. 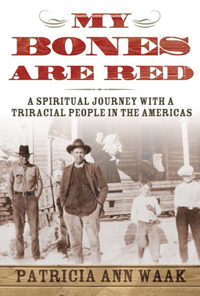 My Bones Are Red primarily tells the stories of the Perkins family . They would stay in Louisiana for at least four decades before crossing the border into Texas. For the first time this book tracks family members who would be sequentially classified by the U.S. census as black, “free people of color,” mulatto, Indian, and white over a period of one hundred years. Historical evi-dence suggests the Perkins family and the families they married into were a combination of Native American, African, and British. What started out as a quest to find the mother of her beloved grandfather, became for Patricia Waak a revelation about the diversity of her family. It became, in fact, a spiritual journey as she visited cemeteries, courthouses, and archives from Accomack County, Virginia, to Goliad, Texas. Filled with transla-tions of old court cases, accounts from oral history, and the results of countless hours of research, she also invites us to participate in her own dis-covery through original poetry which introduces each chapter. Included are photographs, genealogical charts, maps, and copies of old documents. The journey to discover the story of one line of her family, becomes for the author a farewell to her mother and an honoring of the people who contributed to who she is today. Patricia Waak’s career in the United States and overseas has dealt with popu-lation dynamics and their effect on human and environmental health. Most recently she has been the director of human popu-lation and environment programs and a senior advisor for the National Audubon Society. She is the author of numerous books and articles, including Planet Awakening. She lives in Colorado with her husband and two dogs.